Former President Barack Obama speaks as he campaigns in support of Ohio gubernatorial candidate Richard Cordray, Thursday, Sept. 13, 2018, in Cleveland. Former President Barack Obama is coming back to town this week. Obama will headline a rally Friday for Sen. Bob Casey and Gov. Wolf, who will both appear on the ballot when Pennsylvanians head to polls in November's midterm elections. Voters are ‘on fire about politics.’ Why the 2018 midterm elections feel so epic. North Philadelphia: Progress Plaza, 1501-17 N. Broad St.
West Philadelphia: 4409 Chestnut St.
Mount Airy: 6817 Germantown Ave.
Upper Darby: 130 S State Rd. Doylestown: Scott Wallace for Congress office, 80 N. Main St. It's not the first time Obama has weighed in on the upcoming election. 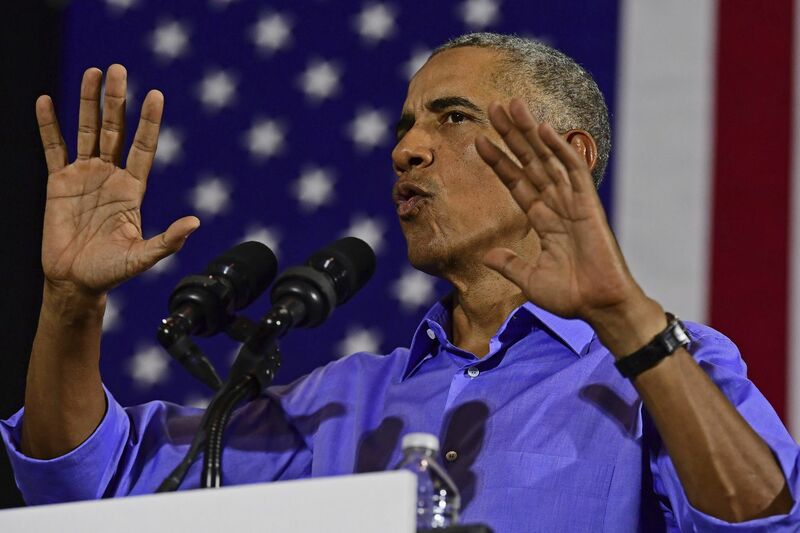 Last week, the former president appeared in Ohio to rally behind Democratic gubernatorial candidate Rich Cordray. Obama also delivered a strong message to Republicans while speaking at the University of Illinois-Urbana Champaign this month. Meanwhile, Donald Trump Jr. will headline a Pennsylvania Republican Party fundraiser in Hershey on Friday, while President Trump stopped in Luzerne County early last month to rally for U.S. Rep. Lou Barletta, who's eyeing Casey's seat in Congress. "Now listen, this seat is very important, because we want to keep this economy going," Barletta said at the rally. "We're not tired of winning. … Help me help President Trump make America great again." Former first lady Michelle Obama will swing by Philly on Nov. 29 as part of a book tour. Public access to the venue for Friday's rally begins at 2:30 p.m., according to the Pennsylvania Democratic Party. Obama is expected to speak at 4:45 p.m.